How long do you think it would take to sell a house dedicated to the comfort of cats? We're not talking about the kind of feces-strewn cat-hoarder hovel that regularly shows up on the local news as a neighborhood nuisance. This is "The Cats' House" in San Diego made world famous -- some would say notorious -- via video as a paragon of feline-friendly design. The 1,300-square-foot home, most of which is included in its maze of kitty-scale ramps, platforms, stairways, tunnels, cutouts and (of course) scratching posts, reportedly ended up selling in one day. 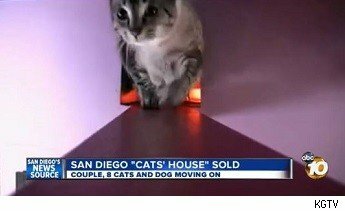 Home sellers Bob Walker and Frances Mooney had to make The Cats' House a bit more vanilla for the sale -- its dizzying fun-house colors (as seen in the video above from San Diego station KGTV) were covered in white. But even with its kitty playground still in place, in Southern California's hot housing market their home was catnip for buyers. The home's new owners reportedly don't even own a cat, reports The Associated Press. Compare that to the example of the "Steampunk Loft," which only a year ago struggled to find a buyer after being thoroughly outfitted like a Jules Verne fantasy. The New York City apartment (subject of an AOL Real Estate video) didn't sell until early this year, after having its early-Industrial-Age decor stripped away. Under normal circumstances that's more the rule than the exception, if you listen to real estate pros, who warn that homes that have been customized a little too much can be a turn-off at resale. Among the kind of improvements that are consistently seen as bringing the most value: updated kitchens and bathrooms. And, of course, when it comes time to put a home on the market -- as the sale of the The Cats' House might prove -- don't underestimate the appeal of a new coat of paint. The take-away for the Walker and Mooney as they set up their new household in Virginia with nine cats and a dog? That seems to be: Go bigger. They told the AP that they'll be looking to buy a home in Fredericksburg that can accommodate an even larger recreation complex for the felines.